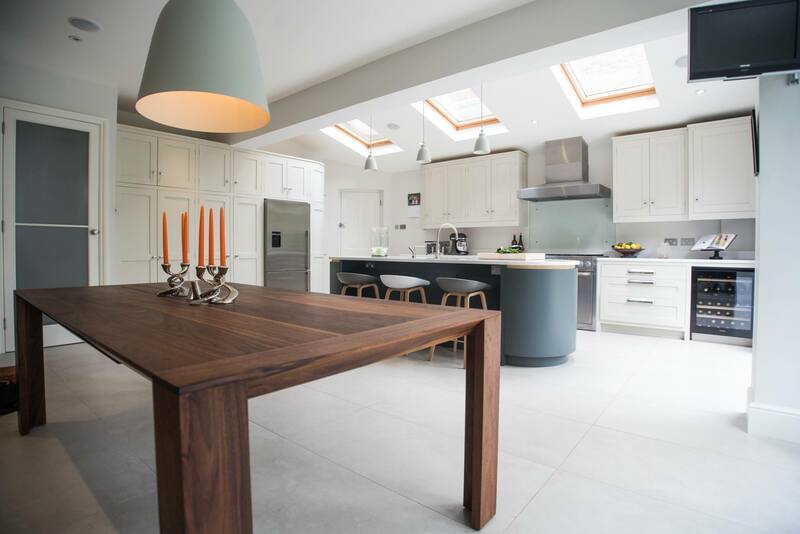 Planning a new kitchen is possibly one of the most exciting parts of home renovation or restyling, but getting it exactly right can be a minefield, with so many component parts to consider; from lighting to splash backs to flooring. In this mini-series, we explore the various elements that come together to create a fantastic kitchen, starting with flooring which plays a key role in the appearance and outcome of any interior project. Choosing the right material for your space and lifestyle is essential but how do you deal with the myriad of choices? I feel that the key is to identify your kitchen style, how much maintenance you are willing to undertake and, crucially, how much foot traffic there is likely to be; if you are a working couple your needs are very different to a busy household with several growing kids. From Limestone and Granite to Slate, there are plenty of choices in the natural world. The beauty of using a natural stone finish is the uniqueness; each piece of stone is different to its neighbour and has a depth of tone rarely found in man-made products. Stone is classical and never loses its beauty. Works well with underfloor heating and is a great heat conductor. Very hard – consider the breakages if you are clumsy! Can feel rather cold without underfloor heating. The more irregular stone surfaces can be difficult to clean. Darker shades may show signs of wear more rapidly. Needs a strong and level base and is unsuitable for a floating floor. Concrete can provide an ultra-modern industrial look if that is your style preference. It needs to be laid by experts as its very difficult to achieve a sleek look. Has great thermal qualities – absorbs heat during the day and releases it at night. It can be poured onto an existing floor so can cut down on pre-preparation. Works well with underfloor heating. Can chip or crack if it is not laid well in the first place. Unforgiving to feet or dropped breakables. Could be slippery without a matt finish. Resin is fast gaining popularity because it can be poured over the whole kitchen floor, giving a seamless finish. It can be finished in matt, silk or gloss and in different colours. It is waterproof, relatively tough and easy to clean with warm soapy water. It’s available in lots of colours and can be customised with patterns. It can be poured over both concrete and timber. Does not have the depth or character of wood or stone. It can scratch – possible to repair but the whole floor would need to be sanded and resealed. Spillages can stain the resin if not dealt with quickly. If you prefer easy maintenance then porcelain tiles could be perfect for your kitchen. They are hard wearing and don’t require any sealing. They come in thousands of designs, sizes and styles and can even be made to look like other surfaces – wood, leather or concrete for example. Hygienic and very easy to clean. Hard to scratch or chip and can be cleaned with anything. They can look and feel cold. More expensive than ceramic tiles. Unrepairable if they do suffer a chip. Unforgiving on feet and crockery. They are usually made from clay and then glazed on top. They are available in pretty much any style, size, colour or texture. Can also mimic other finishes such as wood, etc. They’re also suitable for underfloor heating. Not as hard-wearing as porcelain so could crack or chip more easily. Must be laid on a very solid flat floor. Hard on feet and dropped crockery. Nothing can ever really match the beauty of real wood. It is available in a wide range of shades and grains and works well in any setting, from ultra-modern to country cottage. Reclaimed boards are beautiful but more difficult to lay due to varying thicknesses. Parquet floor must be oiled/waxed regularly and cleaned more carefully. Wood is forgiving on your feet. It is renewable and recyclable. Sturdy and, with care, very long-lasting. It can be sanded to look like new. Could be stained in a huge number of colours. Solid wood boards can move, particularly if mopped often. The need a sub-floor which makes installation more expensive. They will stain and scratch over time and can show up high wear areas. Many people are moving to engineered boards because they look can look like real wood but are more stable. Flat and don’t expand or contract. Well sealed and therefore better for cleaning and mopping. Less character than real wood. Can become scratched and stained in heavy traffic areas. Cork is sustainable and therefore good for the environment. It is warm and has some bounce and can be coated to give a wider choice of finishes. Naturally antibacterial and therefore is resistant to mould and mildew. Non-slip, fire-retardant and insulating (it’s filled with lots of tiny air pockets). Can be sanded and resealed to revive and revamp. Heavy furniture could leave an imprint. Can fade in strong sunlight. Can be scratched and damaged easily. Cork can handle spills as long as they are mopped up promptly but if liquid is left on the floor, damage can occur. Lino is made from natural materials (linseed oil, cork dust, wood dust and resin) with a jute backing and its production doesn’t take huge amounts of energy so it is pretty eco-friendly. It comes in a huge range of colours and designs. Can come in sheets or tiles but sheets are far more waterproof. Feels warm underfoot and quite forgiving on crockery! Great for allergy sufferers as it doesn’t harbour dust mites. Can be laid over an existing floor. Difficult to cut and lay so must be fitted professionally. Can be damaged by sharp materials. Can wear or fade over time. Rubber is a durable and sleek option which can be stunning in a modern space. It comes in tiles or large sheets and with textures, although a flat surface is easier to clean. Feels slightly bouncy and is kinder on the feet and crockery! Non-porous so very easy to clean. Can be a little slippery when wet or if polished. Heavy furniture can leave dent marks. Darker colours could fade in constant sunlight. Requires careful preparation prior to installation. Not necessarily good for underfloor heating – check with suppliers beforehand. As you can see, there are many, many different choices available for your perfect kitchen floor, some of which we have not even touched upon here. All of them have their pros and cons so it is well worth making a list of everything that you need to take into consideration personally, for example, kids and pets, and then doing your own in-depth research. Spending a little extra time considering your options is well worth the effort if you want to avoid costly mistakes which may need to be rectified later.